India has always been proud of its diversity and its capital is a fine representation of this. Delhi is distinctly divided into two contrasting worlds – Old Delhi and New Delhi. Both have their own distinct characteristics and cultural styles from aesthetics and design to its very residents. In fact, it can be said that the lifestyle and mindset of the inhabitants in these two areas are worlds apart. That said, there is plenty of integration and a few resemblances. Perhaps it's best to think of the two areas as sisters. One is laid back, warm and welcoming, but rough around the edges. The other is more refined, immaculately dressed, formal and ambitious. And visitors can take advantage of experiencing two cities in one. Shahjahanabad, today’s Old Delhi, traces its origins back to the Mughal Era when the emperor Shah Jahan declared it his capital. He built Old Delhi as a walled city with many entrance gates and named it Shahjahanabad in 1639. Today, only parts of the walls remain but you can still see traces of the city as it once existed. Shah Jahan was particularly fond of good architecture and many of the buildings here can be attributed to his commissions. The Red Fort is one such construction. Built in 1639, the sandstone Red Fort is a magnificent piece of architecture. Within its wall are beautiful gardens, palaces and halls. Mughal Emperors made it their home for around 200 years. In recent years, the Red Fort’s significance has not been diminished, either. Keeping with tradition the Prime Minister of India, Narendra Modi, delivers his annual Independence Day speech at the Fort. In 2007, the Fort was declared a UNESCO World Heritage Site. Another iconic Shah Jahan structure is Jama Masjid. Built between 1644 and 1656, it is possibly the most famous mosque in India and is still a place of worship today. While you can visit any day of the week, it’s a good idea to avoid Fridays when worshippers gather for the holy day. When it comes to setting up shop in the world’s second most populated city (Tokyo wins top spot by 13 million people) space is at a premium. Old Delhi is a maze of narrow roads and by lanes, bustling with people, cycle rickshaws, shops and stalls. Hawkers line the footpaths with their wares, and often, spill out onto the road. You’d be better off grabbing a cycle rickshaw or navigating these paths by foot. While it may all look like mayhem, these lanes and areas have their own identities. India knows how to do markets, and one of the largest and most popular is Chandni Chowk. Locals come for the food, and tourists love the mix of stalls: traditional clothing and raw fabrics sit alongside intricate jewellery, modern gadgets, and, given this is India, a wide variety of other curios. On the western end of Chandni Chowk is Fatehpuri Masjid, a beautiful mosque, built in 1650 by Fatehpuri Begum, one of Shah Jahan’s wives. The British later sold the mosque to a Hindu family after the War of Independence, but it was later given back to the people by the Government of India. Khari Baoli, a street adjacent to Fatehpuri Masjid, is worth adding to the itinerary. It is home to the largest spice market in Asia – you may smell it before you see it - so stock up on unusual spices and dry fruit both of which make great souvenirs (but check the customs rules first). Chawri Bazar, the first wholesale market in Delhi is a short walk south. It began selling hardware in 1840 but has since moved on to selling copper, brass and paper. It is the perfect spot for an afternoon of people watching. If you’re stopping for a snack, expect food in Old Delhi to be brimming with traditional Indian flavours. From samosas and pakoras, to chaat, curries and parathas, the options are rich, as are the Indian sweets – if you’re ready to indulge, Old Delhi won’t disappoint. New Delhi, on the other hand, has a vibrant international food scene, so if you need a break from spicy curries, finding a good Japanese or Italian restaurant won’t be difficult. And where there are great restaurants, great bars follow. People watching with a drink at the city’s hottest nightspot is as easy to do in New Delhi as it is in any other city in the world. As you travel from Old Delhi to New Delhi, be prepared for a significant change in what you see outside the taxi window. During British rule, many changes were made to city planning, and New Delhi is the result. The British, who initially set up their capital in Calcutta, decided to change the location to Delhi in 1911. After this announcement, British architect Sir Edwin Lutyens, was appointed to design the new, more modern, Delhi. At this point, the older city was named Old Delhi, and in 1931 New Delhi became the seat of national government. Today, Lutyens’ Delhi, south-west of Shahjahanabad, pays homage to Sir Edwin. In stark contrast to the densely populated grid that is Old Delhi, in New Delhi, wide, open boulevards mean getting from point A to B takes longer and it’s best to use a conventional car, rather than a cycle rickshaw. Expensive cars and perfect trees line the pavements instead of the haphazard assortment of vendors seen in Old Delhi. The buildings found in New Delhi are also more modern, and while private houses of one or two-storeys are the norm, high-rises are becoming more and more common. Unlike the street hawkers and temporary markets of Old Delhi, the markets of New Delhi are housed inside buildings. Boutiques, high street and high-end fashion brands, both Indian and international, sit side by side. The newer shopping areas – Select City Walk, DLF Promenade, Ambience Mall – are comparable to malls found anywhere else in the world. 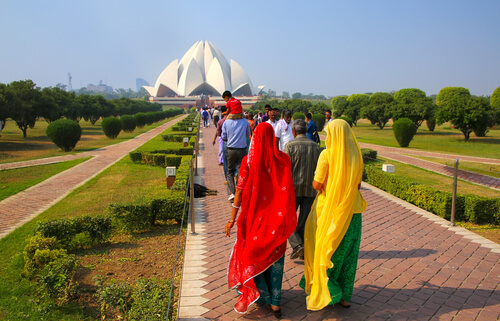 There are also many historical and stately buildings in New Delhi: India Gate, a memorial made for the Indian soldiers who fought in World War I, the Qutub Minar, a 240m high minaret, the Parliament House, and the President’s home known as Rashtrapati Bhavan. 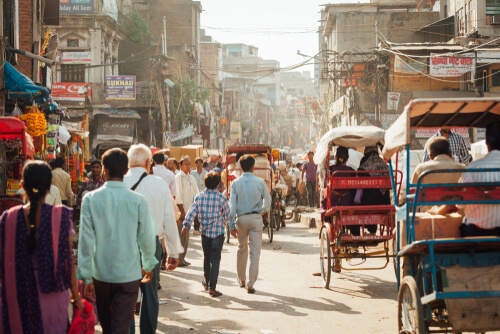 While modernism, globalisation and technology have changed many things for Delhi, both Old Delhi and New Delhi have managed to retain their identity giving visitors to the Indian capital a sense of the new and old traditions that make up Indian life.